eMotion LV1 gives you unprecedented control over every aspect of your live sound. Each of the mixer’s channels has its own plugin rack capable of running up to eight SoundGrid-compatible plugins. This means you can mix live with hundreds of your favorite plugins—all running inside the mixer itself. All plugin presets and chains saved in eMotion LV1 can be shared with the Waves MultiRack and StudioRack plugin hosts, enabling you to move seamlessly between live and studio environments. The mixer’s channel strip—its standard EQ, filters and dynamics processing—is provided by Waves eMo plugins: eMo D5 Dynamics, eMo F2 Filter and eMo Q4 Equalizer. All three are designed for maximum clarity and efficiency in a live environment. All three are included with the eMotion LV1 mixer. The LV1 also integrates smoothly with the Dugan Speech automixer plugin (purchased separately), which is easily accessible from each LV1 channel. You can control eMotion LV1 using industry-standard hardware controllers, multi-touch screens and diverse portable devices, ranging from four touchscreens to a single laptop or tablet. No matter which device you are using, eMotion LV1 has the same intuitive workflow, with a user interface built for flexibility and speed. eMotion LV1 uses the SoundGrid infrastructure for audio networking. It can be configured as a portable or stationary setup, and can connect to any SoundGrid-compatible I/O or server. This means you can easily carry your mixer with you and run it anytime, anywhere—at home, in your hotel room, on the tour bus, or at the live venue. This way you can have all the time you need to work on your sessions, whether offline or with full-on audio, and make sure you are 100% ready for your show. When rapper Pitbull gave a 7-night engagement at The Axis, Las Vegas, his FOH engineer Will Madera chose the eMotion LV1 live console to mix the shows. FOH engineer Tomas Wolfe keeps a smooth live mix for RTJ’s sold-out shows, even with mic cupping, heavy bass and other challenges faced at live hip hop shows. 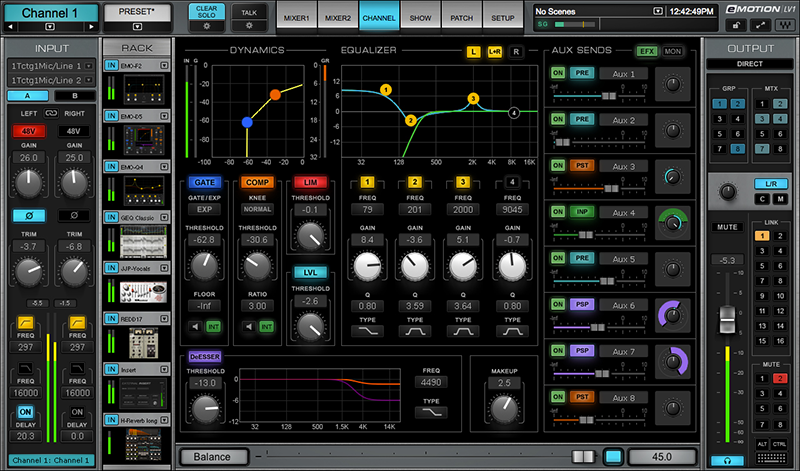 Find out how he does it running plugins inside his eMotion LV1 mixer. FOH engineer Jon Schumann (Mew, Lykke Li) has been mixing Danish electropop singer/producer MØ on her recent U.S. tour. We met Jon at Coachella to discuss how he mixes the shows with plugins running via his eMotion LV1 live mixer. Phil Peters, Director of Audio Services and FOH Mixing Engineer for the Christian Broadcast Network, chooses the eMotion LV1 Live Mixer, the Waves Tracks Live recording software, and Waves plugins for CBN broadcasting. FOH mixer Vance Galloway shares why the LV1 is his mixer of choice for lives dates with electronic artist Nicolas Jaar, for pristine sound, flexibility and portability at venues ranging from outdoor festivals to theaters and clubs. FOH engineer Ken ‘Pooch’ Van Druten (Linkin Park, Kid Rock, Kiss) reports on his first time mixing a live gig with the eMotion LV1 live mixing console. Front-of-house engineer Dani Munoz (Flo Rida, Enrique Iglesias, Animal Collective, Snoop Dogg) chooses the Waves eMotion LV1 Live Mixer, Extreme Server and Waves plugins on tour for Canadian reggae fusion band Magic!. FOH engineer Jon Schumann (Kashmir, Mew, Carpark North, Kent, Mercury Rev) is among the live audio professionals employing tools from Waves Audio. For dates with MØ, Schumann chose the Waves eMotion LV1 live mixer, SoundGrid Extreme Server and various Waves plugins. Popular Brooklyn club and live music venue Elsewhere has chosen Waves’ eMotion LV1 as its in-house live mixer. Technical Director David Levin shares why the LV1 is his ideal choice for the venue’s 250-capacity Zone One. We highly recommend you consult the Waves Sales team with any order of an eMotion LV1 system in order to get the configuration best suited to your needs. Bucket View in the CLA MixHub plugin is currently not supported in eMotion LV1. When mapping CLA MixHub to the Channel overview window, graphic errors may show in the overview display. Installing eMotion LV1 v10 will update all SoundGrid firmware (interfaces and servers) and drivers to v10, which is not compatible with SoundGrid v9 software. To also use MultiRack SoundGrid or SoundGrid Studio, you will need to switch between v10 and v9 SoundGrid firmware and drivers. Mac mini 2014 and up, i7, 8 GB RAM, minimum 256 GB SSD (not Fusion), Windows 10 via Bootcamp. HP EliteDesk 800 G3, Customized with i5-7600 CPU @ 3.5Ghz, 16 GB RAM, 128/256 SSD, Intel HD Graphics 630, 3 display ports, Ethernet port (Intel I219-LM), Windows 10. Windows Users: Connecting to a SoundGrid network via Thunderbolt 3 is currently not supported. Please consult this list of all known issues + issues fixed in eMotion LV1 v9.14. VPN software can alter network settings to meet its requirements. These changes can the affect the network ports used for SoundGrid and may compromise performance of the SoundGrid network. We strongly advise that you remove, disable, or turn off all VPN software while working with SoundGrid. We cannot test every single model on the market, but we trust that similar devices will be compatible as well. eMotion LV1 is compatible with all SoundGrid I/Os. For some systems it is advisable to use a secondary computer for recording/playback. This provides optimal CPU and disk performance on the primary computer that is running eMotion LV1. All SoundGrid servers are supported, except DiGiGrid DGS-XL (not sold by Waves), which is neither certified nor supported for use with eMotion LV1. 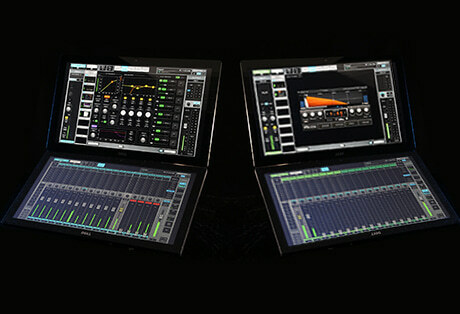 For best results we highly recommend to use eMotion LV1 with the SoundGrid Extreme Server. SoundGrid Impact Server and DiGiGrid IOS are supported by the eMotion LV1 16-channel configuration at sample rates of up to 48 kHz. For detailed CPU consumption benchmarks, please see the Tech Specs tab of the SoundGrid Extreme Server, SoundGrid Server One and SoundGrid Impact Server pages. Cat 5e, Cat 6 and Cat 7 cables are supported. Tested and approved cable length: 100 meters from I/O box to switch; up to 4 hops/switches. Consult this page for further info. Waves plugins: See our plugin compatibility chart and plugin latency chart. eMotion LV1 v10 supports 64-bit plugins only, and therefore does not currently support third-party plugins. SoundGrid-compatible plugins by other manufacturers will be supported in the future, pending the manufacturers’ schedule. As a live sound engineer, you probably want three things in your show: great sound quality, quick & easy operation of your console, and minimum last-minute surprises. eMotion LV1 gives you all three – and it does it in a way that’s revolutionary. It means you have the sound quality you’ve come to expect from Waves, right there in your console’s mix engine. It also means that you have pinpoint-precision control over your sound by running however many plugins you want from the console itself. It means you have all the flexibility that software allows when it comes to operating your console quickly and easily, whether you are using multi-touch screens or any other control surface. And it means that your console is 100% portable, helping you be 100% prepared in advance for your show. The mixer has a 32-bit floating point mix engine that represents the pinnacle of Waves’ accomplishments in the field of audio. eMotion LV1’s channel strip—its basic EQ, filters and dynamics processing—is provided by Waves eMo plugins that are optimized for live environments, with transparent sound, zero latency, and a user interface specifically designed for quick operation, clarity and efficiency. Each of the mixer’s channels has its own plugin rack, with room for 8 SoundGrid-compatible plugins. This means that nothing stands between your mixing console and your processors—all your plugins are now controlled directly from the mixer itself. Up to 64 channels, 8 plugins each – you do the math of the massive mixing possibilities open to you, and what they can do for your sound. The main mixer window gives you all the most important info you need at a glance – all channel inputs and parameters, routing, plugin inserts and more – with additional windows providing more detailed views. Channel window for focused control of your plugins, including a Touch-and-Slide slider for quick & easy control of all plugin parameters. Flexible control of your plugins racks – instantly switch the order of plugins within each rack, copy plugins and their presets from channel to channel, add hardware processors as external inserts on your plugin racks, and much more. Support for up to four multi-touch screens, as well as diverse industry-standard control surfaces. The exact same user-friendly interface, no matter which display or control device you are using. All digital mixers with a software interface let you edit your sessions offline, without audio, when you’re away from the live venue. eMotion LV1 goes one huge step further by letting you actually mix your sessions, with audio, no matter where you are. Here’s how it works. 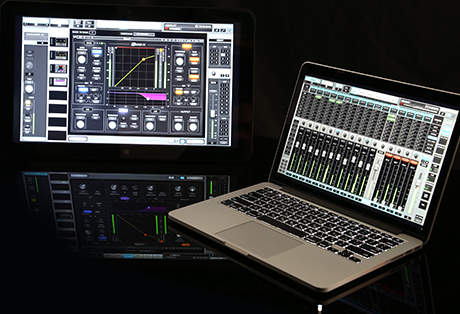 To use eMotion LV1 with audio, you need to connect the PC or Mac running the mixer to SoundGrid-compatible devices – an audio interface and a server. But here’s the beauty of it: these can be any computer, any SoundGrid interface, any SoundGrid server – not necessarily the ones you’ll be using at the actual show. At the venue, your computer may be a desktop with large touchscreen monitors – but at home, you can use a small laptop or tablet. 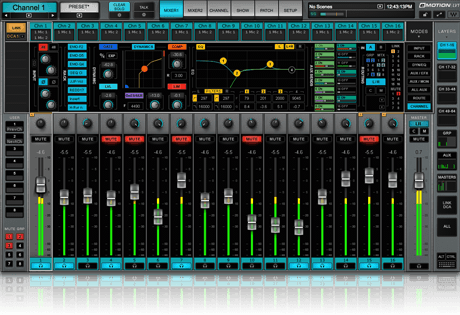 At the venue, you can take advantage of the SoundGrid network to connect any number of large interfaces with lots of I/O, as well as extra mixers, extra DAWs for playback and recording. You can also share stageboxes between multiple mixers used at FOH and monitors. 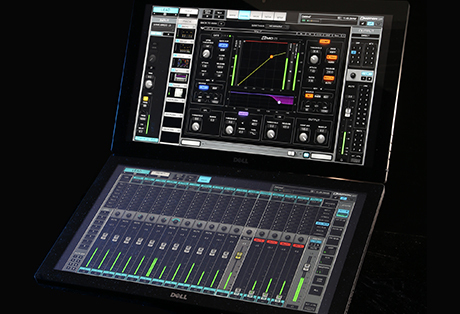 But at home, in your hotel room, or on the tour bus, you can use as little as a small server and a compact, lightweight interface in order to mix. This means that you can always take your full mixing system – as many as 64 stereo channels, limitless processing – in a small carry-on bag or even a backpack. Run a pre-recorded audio session on the LV1, and work on your actual audio mix well ahead of the show – anytime, anyplace. 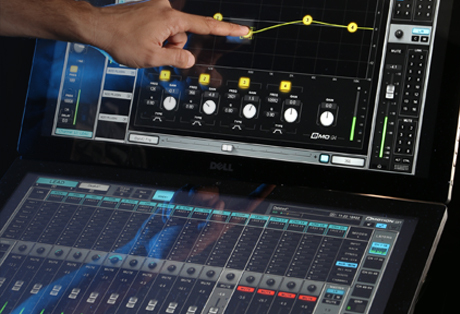 Need to share your inputs with a monitor or broadcast engineer? Connect your LV1 mixers to the same network switch and share stageboxes between them. This means you can get your sources from the stage to multiple destinations at the same time, with separate gain control for each engineer and without having to split the signal with dedicated gear. When multiple devices are used on stage, it is advisable to connect all of them to a single Ethernet switch that connects to the main switch. Daisy-chaining Ethernet connections in these setups is not advisable. In this setup, two eMotion LV1 systems are connected to the same SoundGrid network and are sharing stageboxes between front-of-house and the monitor position. In this setup, the eMotion LV1 mixer is receiving audio from your MADI stagebox via a MADI-to-SoundGrid audio interface. Up to 128 audio channels are being streamed to the eMotion LV1 mixer in real time. 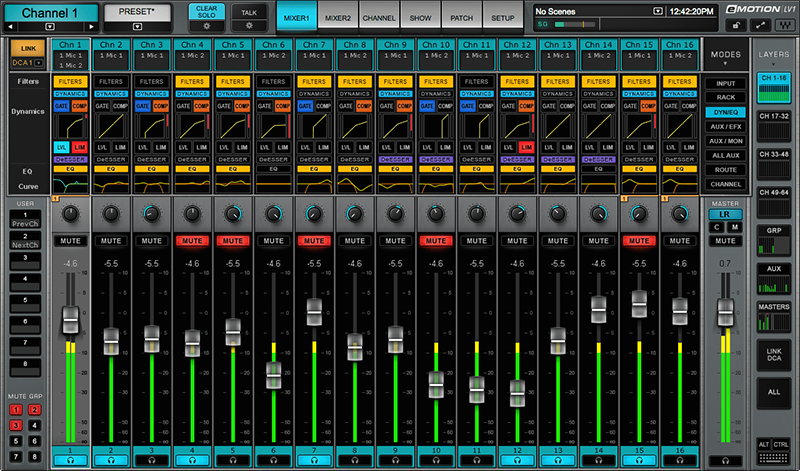 In this setup, the eMotion LV1 mixer is used in conjunction with an Avid VENUE console. 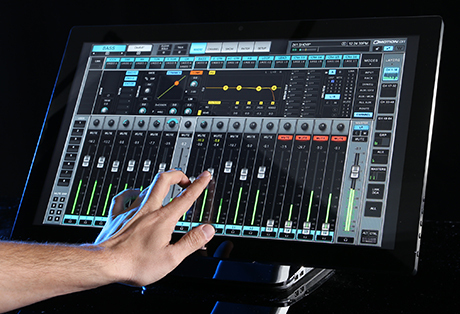 eMotion LV1 provides monitor mixes, while Avid VENUE provides the FOH mix. 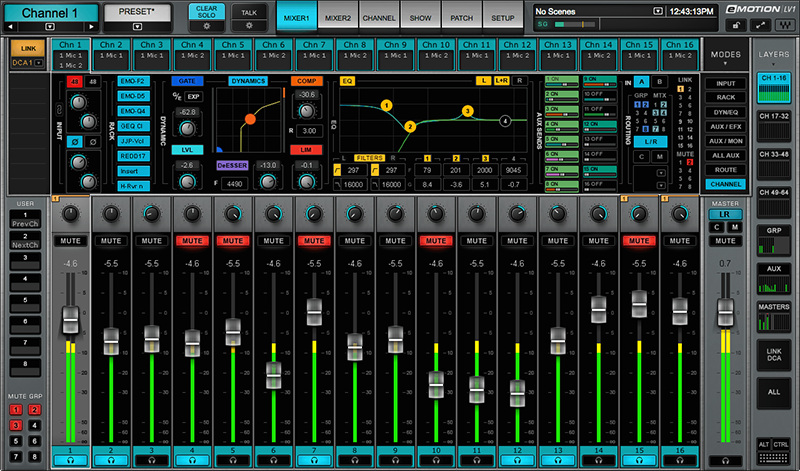 The two mixers are connected via a DiGiGrid DLI SoundGrid-to-Pro Tools audio interface.